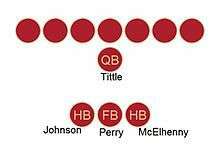 The Million Dollar Backfield was a National Football League (NFL) offensive backfield of the San Francisco 49ers. Composed of four future Pro Football Hall of Famers, the backfield was also referred to as the "Fabulous Foursome" and "Fearsome Foursome". Formed in 1954, well before players earned six-figure salaries, the unit was named as such for its offensive prowess. The only full-house backfield to have all four of its members later enshrined in the Pro Football Hall of Fame, it is regarded as one of the best backfields in NFL history. The Million Dollar Backfield began its construction in 1948 with the team's signing of fullback Joe Perry. In 1951, quarterback Y.A. Tittle was drafted in the 1951 NFL Draft. Tittle had played the previous three seasons with the Baltimore Colts, and became available in that year's draft after the Colts folded. The next year the 49ers drafted Hugh McElhenny, a halfback, in the first round to complement Tittle and Perry. All three were invited to play in the Pro Bowl for 1953, comprising the starting offensive backfield for the West. The final piece of the puzzle came in 1954, when John Henry Johnson joined the team. Despite the name, not even when combined did the players' salaries approach the million-dollar figure. Johnson, who never made more than $40,000 in a season, joked in 1987 that he was "still looking for the million." For three seasons, the backfield challenged opposing defenses with Tittle's arm, Johnson's power, the speed of Perry, and the elusiveness of McElhenny. During their first year together, the backfield shattered the team record for rushing yards in a season. The 49ers led the league with 2,498 rushing yards and 28 rushing touchdowns, and averaged 5.7 yards per carry and 208.2 rushing yards per game. Perry, McElhenny, and Johnson each finished the season in the top ten in rushing yards, with Perry and Johnson finishing first and second, respectively. McElhenny ranked eighth despite playing in only six games before being sidelined by a season-ending shoulder injury. Tittle, Perry, Johnson, and Detroit Lions halfback Doak Walker comprised the starting backfield in the 1955 Pro Bowl. 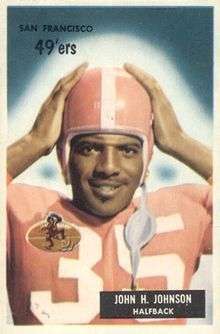 Perry, taking advantage of Johnson's blocking, became the first NFL player to rush for 1,000 yards in consecutive seasons when he did so in 1954 and 1955. Writing for Jet magazine in 1955, sportswriter A. S. "Doc" Young called Perry "the bellwether of the greatest rushing backfield in pro football." McElhenny was a valuable asset in the passing game, becoming a favorite target of Tittle on screen passes. Tittle's 17 touchdown passes in 1955 led the league. With the extremely potent offense, many thought San Francisco was due to win a NFL championship, but defensive problems landed the 49ers in third place behind the Lions and Chicago Bears in 1954. Moreover, the offense struggled after McElhenny's season-ending injury. San Francisco's Million Dollar Backfield was disbanded in 1957, when Johnson was traded to Detroit. The backfield of Tittle, Perry, and McElhenny remained intact through the 1960 season. Tittle played for the 49ers until 1960, after which he was traded to the New York Giants, with whom he had the successful years of his career; he was named AP NFL MVP in 1963, led the team to three straight NFL championship games, and broke several passing records. Consequently, the trade of Tittle for guard Lou Cordileone is seen as one of the worst trades in 49ers franchise history. Tittle retired as the NFL's all-time leader in passing yards, passing touchdowns, completions, attempts, total offense, and games played. He was inducted into the Pro Football Hall of Fame in 1971. 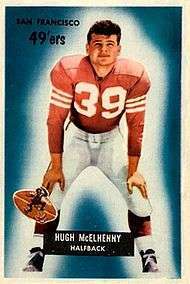 McElhenny made five Pro Bowl appearances with the 49ers before being released by the team in 1960. He was then picked in the 1961 expansion draft by the Minnesota Vikings, with whom he made his final Pro Bowl appearance. He played for the Vikings for two seasons, then reunited with Tittle on the Giants in 1963, and played his final season in 1964 with the Detroit Lions. A member of the NFL's 1950s All-Decade Team, McElhenny retired having amassed the third most all-purpose yards of any player in NFL history. The 49ers retired his No. 39 jersey, and he was elected to the Pro Football Hall of Fame in 1970. Johnson played only three seasons with the 49ers. Like Tittle, Johnson had a late-blooming career; his most productive years came with the Pittsburgh Steelers, well after his time in San Francisco. He became—and remains—the oldest player to rush for 1,000 yards in a single season, when he did so in in 1964 at age 35. He retired in 1966 with the third most career rushing yards in the NFL. Johnson's induction into the Pro Football Hall of Fame came in 1987, and was an honor that contemporaries felt was fifteen years overdue. Perry was with San Francisco for fourteen of his sixteen seasons as a pro, during which he became one of the first black stars in American football. Despite sharing carries with McElhenny and Johnson, Perry's greatest individual success came while playing in the Million Dollar Backfield. After a brief stint with the Baltimore Colts, Perry returned to the 49ers in 1963 for his final season, and he retired as the NFL's all-time leading rusher. He was inducted into the Pro Football Hall of Fame in 1969, his first year of eligibility, and the 49ers retired his No. 34 jersey in 1971. The 49ers' Million Dollar Backfield is the only full-house backfield to have all four of its members enshrined in the Pro Football Hall of Fame. 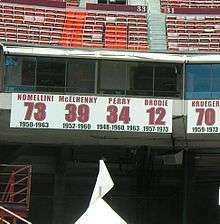 By virtue of their memberships in the pro hall of fame, all four were automatically inducted as charter members of the San Francisco 49ers Hall of Fame in 2009. Longtime 49ers coach Bill Walsh co-authored a book about the backfield in 2000 entitled The Million Dollar Backfield: The San Francisco 49ers in the 1950s. In 2014, a sculpture comprising the four players, crouched over as if in a huddle, was erected in Levi's Stadium. On June 9, 2011, it was announced that Johnson and Perry, who died within months of each other, would have their brains examined by researchers at Boston University who are studying head injuries in sports. Both men were suspected of suffering from chronic traumatic encephalopathy (CTE), a disorder linked to repeated brain trauma. ↑ "Collegian Pair Hot In 49ers Backfield Squad". Lewiston Evening Journal. Associated Press. September 7, 1955. p. 10. Retrieved September 3, 2016. ↑ Richard Goldstein (June 5, 2011). "John Henry Johnson Dies at 81; Inspired Fear on the Field". The New York Times. Retrieved September 24, 2016. ↑ Corkran, Steve (June 3, 2011). "Former 49ers star John Henry Johnson dies". San Jose Mercury News. Retrieved September 24, 2016. ↑ "Joe Perry Stats". Pro-Football-Reference.com. Sports Reference LLC. Retrieved October 20, 2016. 1 2 "Y.A. Tittle Stats". Pro-Football-Reference.com. Sports Reference LLC. Retrieved October 20, 2016. ↑ "Hugh McElhenny Stats". Pro-Football-Reference.com. Sports Reference LLC. Retrieved October 20, 2016. ↑ "John Henry Johnson Stats". Pro-Football-Reference.com. Sports Reference LLC. Retrieved October 20, 2016. ↑ "Grid Rivalries Renewed Today In Pro Bowl". Sarasota Herald-Tribune. Associated Press. January 17, 1954. p. 13. Retrieved October 7, 2016. ↑ Bock, Hal (August 10, 1987). "Ledger look to HOFers". Ludington Daily News. Associated Press. p. 8. Retrieved October 8, 2016. 1 2 "The King". History Release. Pro Football Hall of Fame. Retrieved September 3, 2010. ↑ "1954 NFL Standings & Team Stats". Pro-Football-Reference.com. Sports Reference LLC. Retrieved October 20, 2016. 1 2 "Shoulder Injuries Fell Stars, Reshuffle Pro Grid Standings". Daytona Beach Morning Journal. Associated Press. November 20, 1954. p. 9. Retrieved September 24, 2016. ↑ "Lineups Named For Pro Bowl Today". Daytona Beach Morning Journal. Associated Press. January 16, 1955. p. 14. Retrieved September 24, 2016. ↑ Dwight Chapin, Tom FitzGerald (April 26, 2011). "49ers Hall of Famer Joe Perry dies at 84". San Francisco Chronicle. Retrieved October 19, 2016. ↑ Young, A. S. (November 3, 1955). "Inside Sports". Jet. Johnson Publishing Company. 8 (26): 55. ISSN 0021-5996. Retrieved October 10, 2016. ↑ "Giants Reunite Passing Combo". Toledo Blade. Associated Press. July 18, 1963. p. 32. Retrieved September 4, 2016. ↑ Tameta, Andre (May 22, 2009). "San Francisco's Million Dollar Backfield: The 49ers' Fabulous Foursome". Bleacher Report. Retrieved August 14, 2016. ↑ Maxymuk, John (2007). Strong Arm Tactics: A History and Statistical Analysis of the Professional Quarterback. McFarland. p. 280. ISBN 0-7864-3277-2. Retrieved October 9, 2016. ↑ Damon, Bruce (2010). The Great Book of San Francisco Bay Area Sports Lists. ReadHowYouWant.com. p. 269. ISBN 1-4587-7837-1. Retrieved October 9, 2016. ↑ "Y.A. Tittle Retires, Set Longevity Record". The Morning Record. Associated Press. January 23, 1965. p. 5. Retrieved October 9, 2016. ↑ Roberts, Rich (January 20, 1985). "The King and the President: Hugh McElhenny will assist Reagan with the coin toss". Los Angeles Times. Retrieved October 10, 2016. ↑ Cook, Ron (June 27, 1982). "John Henry He's learned how quickly they forget". Beaver County Times. p. C3. Retrieved October 10, 2016. ↑ Bouchette, Ed (August 7, 1987). "John Henry was a steel-drivin' man". Pittsburgh Post-Gazette. p. 17. Retrieved October 10, 2016. ↑ Players become eligible for induction into the Pro Football Hall of Fame five calendar years after their final pro game. 1 2 Schudel, Matt (April 26, 2011). "Joe Perry, football star of the 1950s and first African American MVP, dies at 84". The Washington Post. Retrieved October 5, 2016. ↑ Carlson, Michael (April 29, 2011). "Joe 'The Jet' Perry: Fast and powerful full-back who became one of American football's first black stars". The Independent. Retrieved October 5, 2016. ↑ "Johnson, member of 49ers' 'Million Dollar Backfield,' dies at 81". National Football League. June 4, 2011. Retrieved September 3, 2016. ↑ "49ers Announce Edward DeBartolo Sr. 49ers Hall of Fame". San Francisco 49ers. May 12, 2009. Retrieved October 9, 2016. ↑ "Niners Legends: Made in Brooklyn". Sports Illustrated. August 6, 2014. Retrieved September 3, 2016. ↑ "Researchers to study 49ers RBs". ESPN.com. ESPN. Retrieved June 9, 2011. Walsh, Bill; Newhouse, Dave (2000). The Million Dollar Backfield: The San Francisco 49ers in the 1950s. ISBN 1583940073.